Ribonucleic acid or RNA is specifically used for translating the instructions offered by DNA as well as for making proteins in human body. For all the new geneticists out there, who have just started working in this domain, I have chalked down ten vital facts about RNA that they must be aware of. Please do buy some time and go through the below-mentioned pointers as it would prove beneficial in the long run. 1.Let us begin with the composition. Each nucleotide of RNA consists of a ribose sugar, a nitrogenous base, and a phosphate. 2.We all know that DNA is double-stranded and has an elongated chain made of nucleotides.On the other hand, RNA molecule could be defined as one strand made up of nucleotides existing in short chains. RNA is also known for having varied shapes such as helix, straight, or twisted. 3.Unlike DNA, RNA does not have thymine. In this model, adenine at the base bonds with uracil. Uracil has the capacity to absorb light and could be defined as thymine in its unmethylated form. 4.RNA is exceptionally useful and performs plenty of functions. It codes, decoded, expresses, and regulates genes. 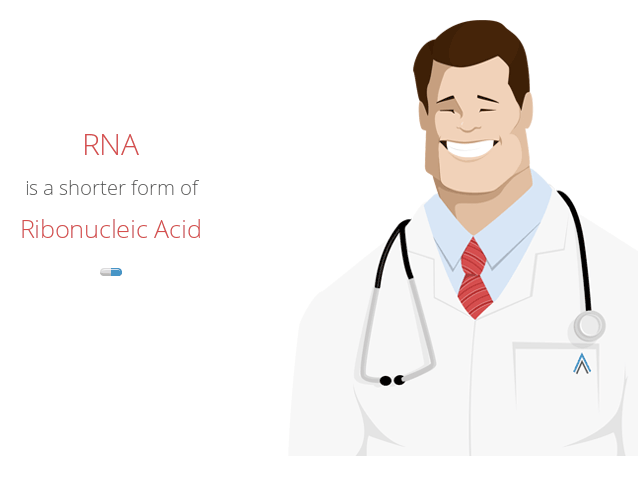 RNA could also be of various types such as messenger RNA (mRNA), transfer RNA (tRNA), and ribosomal RNA (rRNA). 5.When talking about human total RNA, let me acquaint all my readers that only 5% of the human cell is made of this polymeric molecule. On the other hand, only 1% is made of DNA. 6.While DNA is found inside the nucleus of human cells, RNA is found both in both the cytoplasm and nucleus of cells. 7. Certain organisms, especially the viruses, do not have DNA and for them RNA is the only genetic material. 8.RNA is known for silencing the genes and this mechanism is increasingly used to target those genes that cause cancer. According to latest studies, RNA application can destroy the carcinogenic molecules in one’s body. It can also alleviate the side-effects of radio therapy as well as chemotherapy. In the present times, RNA technology is also utilized for developing genome based modified cancer therapeutics. 9.RNA could be used to subdue the expression of those genes that contribute to the ripening of fruits. This effectually allows the fruits to remain on vines for a longer period of time, thus, increasing their season as well as readiness for marketing. 10.Top-notch researchers have stated that it was in the year 1868 that nucleic acids were discovered. However, later studies did indicate that there were varied kinds of nucleic acids and hence varied kinds of RNA, so there is not a definite year, which can be attributed to the discovery of RNA. In 1939, professionals detected that RNA could be used for synthesizing proteins and it is in 1959 that the ways in which RNA could be synthesized were determined. So, all my readers, who wish to be a successful geneticist, are requested to keep the stated facts in mind as they can use these while working.